When it comes to new-build homes, many architects tend to follow a one-size-fits-all attitude to contemporary style. Oftentimes, dwellings are sold based on a pre-designed floor plan, with certain aesthetics that can be modified, but with no real consideration to the surrounding architectural vernacular or plot situation. Today’s project is different. 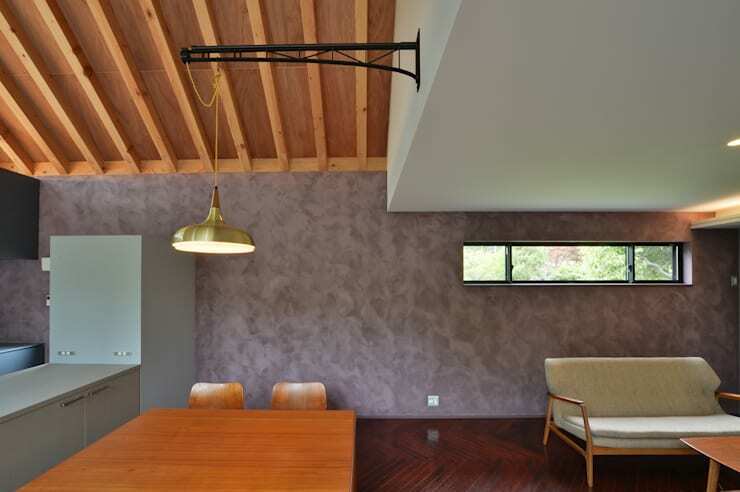 Designed by the Japan-based team at Nobuyoshi Hayashi, this gabled house features a traditional shape and form, with contemporary characteristics, and essential 21st-century amenities. When we think of concrete as a building material, the last thing on our minds are quaint cottage aesthetics. However, this residence is awash with modern ingredients, such as its concrete façade, which is seamlessly juxtaposed with a charming heritage structure. Contradictory in its uniqueness, the residence has an urban quality to it, which ensures timelessness, and a suggestion of unrelenting attitude. If you would like to take a tour inside, check out the images below, and explore this original and intriguing abode. The first image of this home presents us with a creative contradiction. 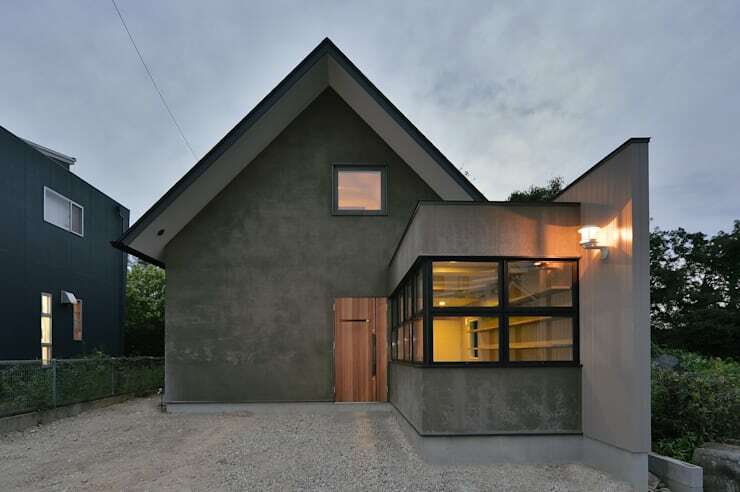 On the one hand, the dwelling is traditional; its gabled roof provides a sense of history and heritage, while the urban concrete façade is contemporary, adding a feeling of chic trendiness. Furthermore, the conservatory like room that juts out from the front of the home is fairly modern in its cubist form, with thick black window frames and a warm, welcoming interior. 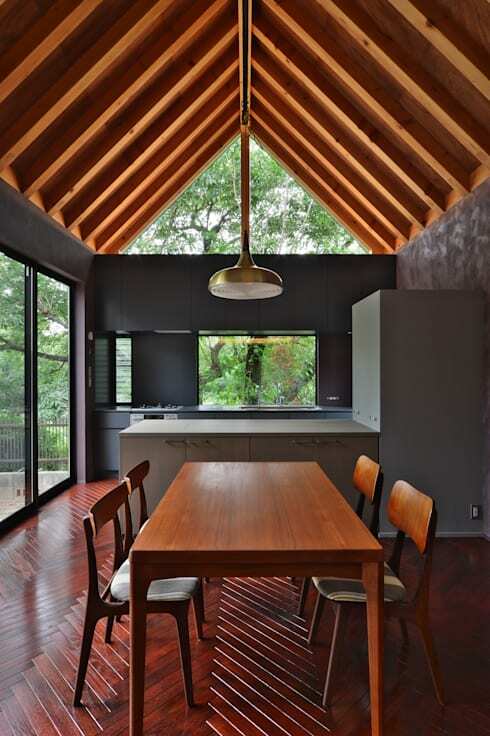 Inside the home the design and décor is highly reminiscent of traditional Japanese design. Boasting a minimalist aesthetic, with plenty of timber features and tones, this space welcomes the occupant, while treating them to a hospitable and alluring ambience. The vaulted timber ceiling adds height to the room, while the end piece is glazed to allow a clear view of the lush scenery beyond. Glazing is also employed in the kitchen, which intentionally frames the exterior garden as a moving artwork for the space. Turning around we see the textured wall and light fitting in more detail. Each component of this home’s design has been thoughtfully considered, contributing to a successful interior. The décor within this space is retro in its design, with a strong mid-century modern aesthetic. This further deepens the concept for the home, which boasts modernity with traditional foundations. 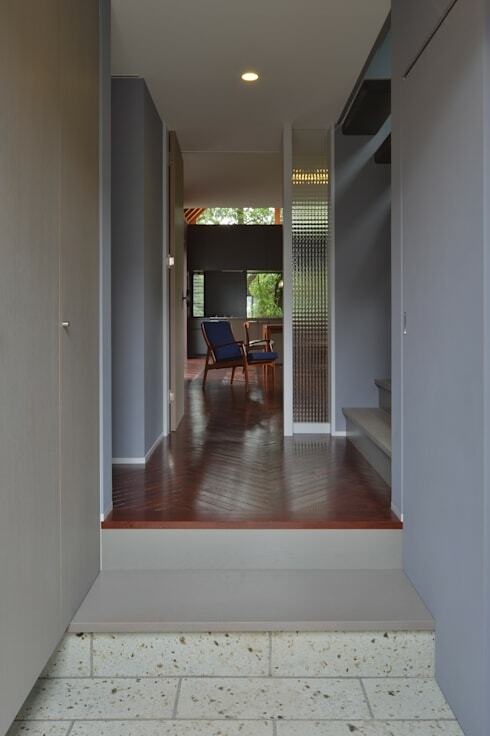 The entry point for the dwelling brings together a sense of tranquillity and serenity with blue-grey tones that emphasise and reflect cool, calm light. The herringbone timber flooring works brilliantly in this instance, contrasting the light walls, and offering a sense of warmth. 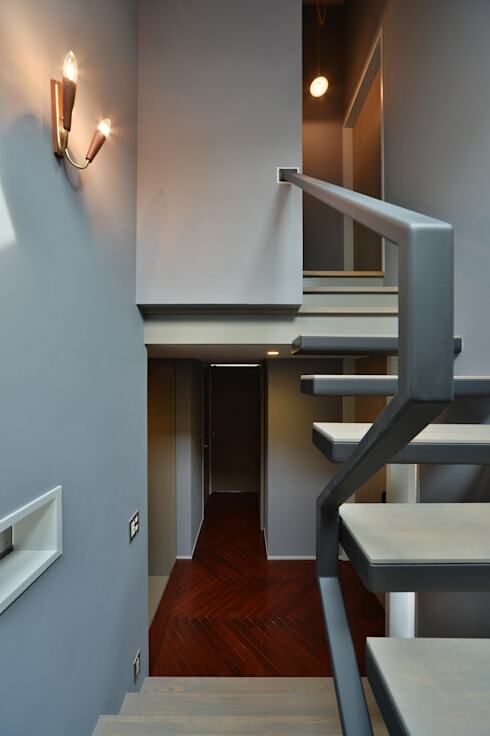 This inventive staircase takes the home’s design to the next level. Replete with geometric angles, the floating steps blend modernity with practicality, while imparting the residence with and attention-grabbing feature. Additionally, the designers have opted for a darker grey colour scheme for the powder-coated steel railing, with a light tread that adds lightness and contrast to the overall design. Next up, we venture into the workspace, which sits in the front outcropped building, which you would have seen in the first image. 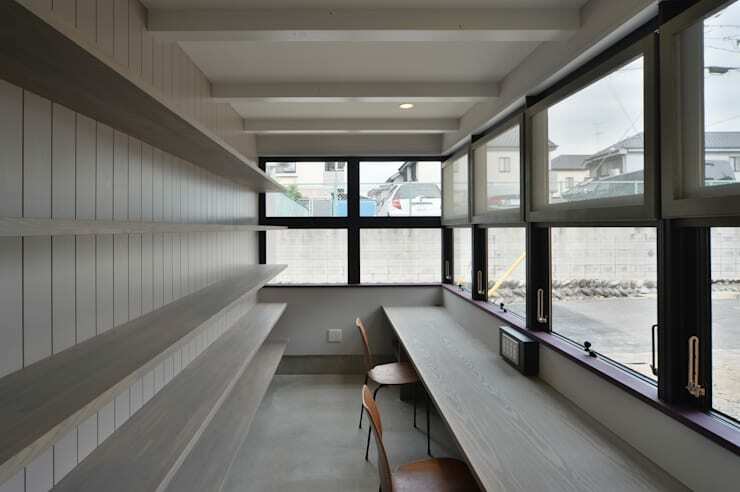 Separated from the main living areas, yet still well-connected, this inspirational home office boasts room for 2 or more individuals, and ample shelving for storage of household or work goods. Finally, no tour of a home would be complete without a quick peek into the most private space of all: the bathroom. 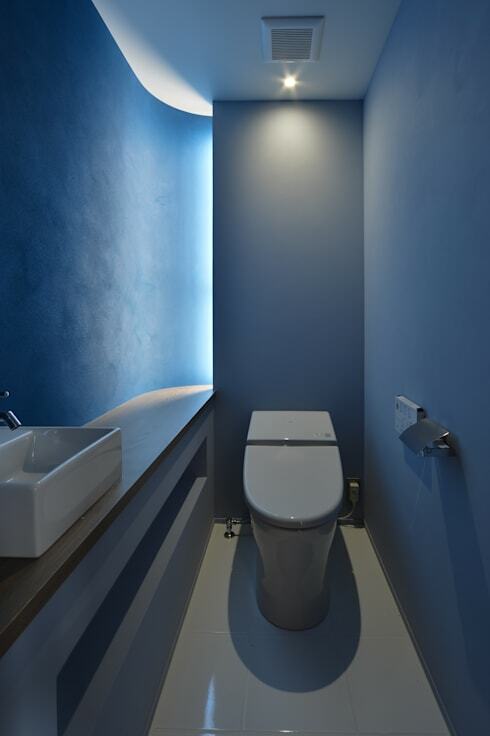 This tiny toilet area is painted in a serene blue hue, which complements the overall scheme seen throughout the dwelling. White fixtures are sleek and clean, while a long window brings light within the space, but is angled to offer privacy from peering eyes. What aspects do you think worked (or didn't work) in this house's design? Let us know below!